The Spartamet is a bicycle with a small internal combustion engine mounted by the rear wheel. They were limited to 25 km/h, the same speed limit as modern electric assisted bicycles which have replaced them in the marketplace. However, the Spartamet still has a following and the riders still need tyres. The Vredestein Comfort in the 42-590 (26 x 1 3/8) size is a hard wearing and robust replacement for the original. Note that these tyres are heavy and can't be folded. Postage can be expensive. For multiple tyres sent together it may work out less expensive than calculated by the webshop in which case we will process a partial refund. If unsure about whether this is the correct tyre size for your bike, please refer to our guide to bicycle wheel and tyre sizes. 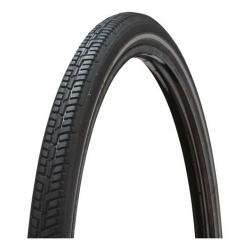 Note that this tyre is sometimes described as being of 37-590 size. Either way, the tyre fits the same rims. The difference is just 5 mm in width.